Mission patches are used by military and space organizations to identify, symbolize and describe a mission’s objectives and its crew. This tradition is also observed in the shady world of PSYOPS where each secret mission of the Pentagon gets its patch. 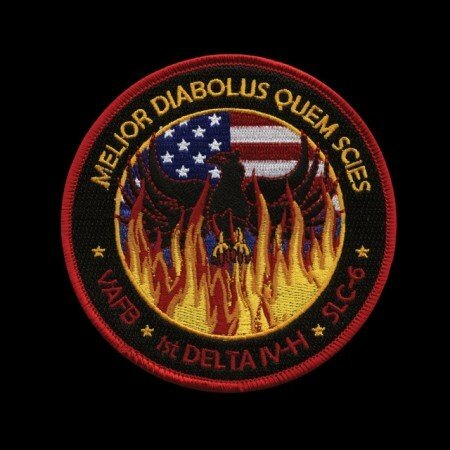 These patches offer a rare glimpse into the Pentagon’s secret operations and the symbolism on them is rather striking: ominous and cryptic phrases, dark occult symbolism, references to secret societies, and sometimes even a rather dark sense of humor. 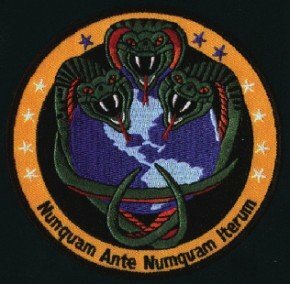 Here’s the top 10 most sinister PSYOPS patches. 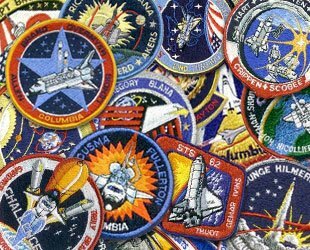 In 1965, NASA began using cloth patches to identify each of its missions and to symbolize the missions’ objectives and their crew. Each rocket launch has therefore a patch designed by crew members and in collaboration with the official design team. The patches are then proudly displayed on equipment and worn by NASA astronauts and other personnel affiliated with a particular manned or unmanned space mission. 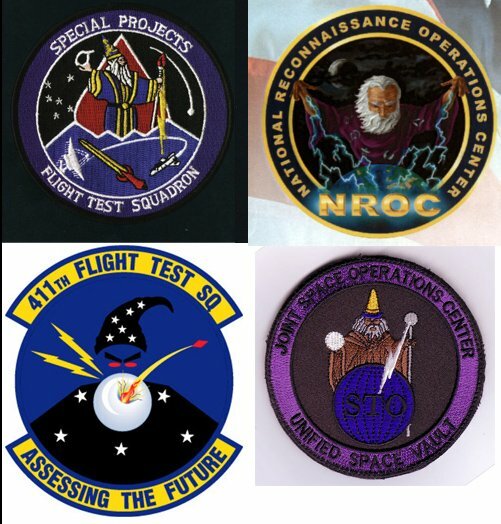 Since then, other organizations involved in space travel and secret operations began using mission patches, including those that specialize in PSYOPS (psychological warfare): the CIA, the Department of Defense and the National Reconnaissance Office (NRO). What does space travel have to do with psychological warfare? Spy satellites. Since 1960, the NRO (whose existence was only declassified in 1992) has launched dozens of secret spy satellites into space, collecting an incredible amount of information on the United States’ friends, enemies and citizens. 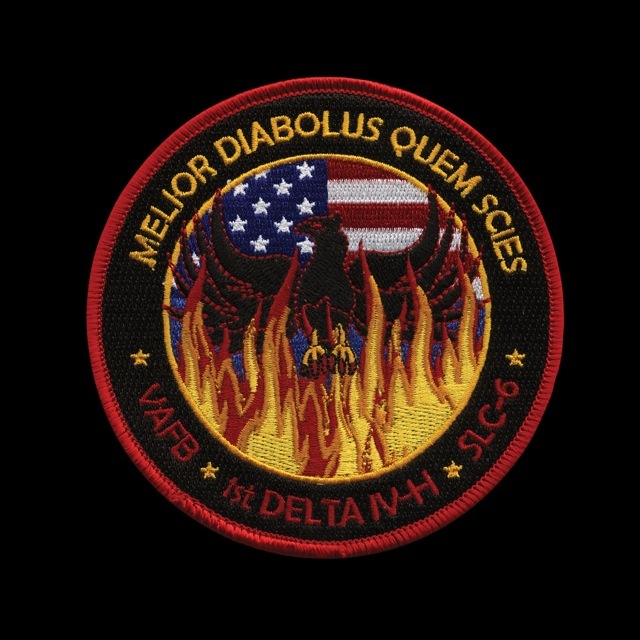 As it is nearly impossible to obtain information regarding these highly classified endeavours, mission patches offer a rare glimpse into the world of PSYOPS. Even if one is not well-versed in symbolism, it is easy to perceive a sinister “vibe” emanating from the patch designs. Laced with strange symbols, ominous creatures, obscure Latin phrases and even dark humor, these patches reflect the mindstate of those wearing the patches. 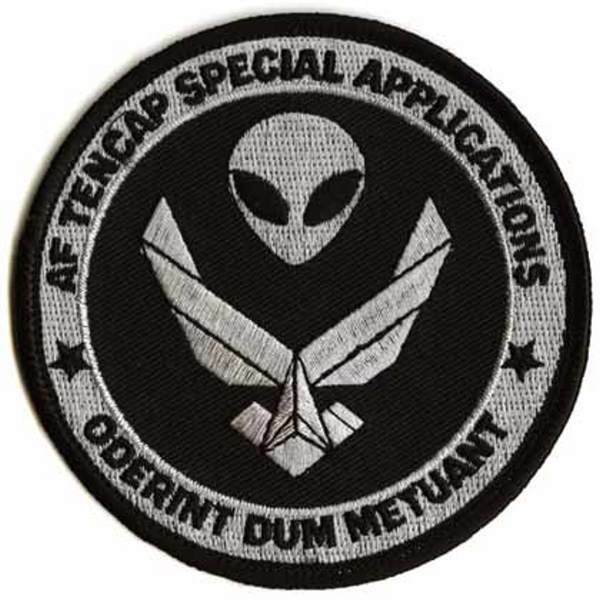 TENCAP is an acronym for “Tactical Exploitation of National Capabilities” and is a collection of programs involving the cutting edge of warfare. In PSYOPS, “Special” almost invariably means “black” or highly classified. Does the “highly classified part” of the mission have something to do with the fact that the badge bears the face of an alien? The saying at the bottom does not help: The phrase “Oderint Dum Metuant” is usually associated with Caligula, the first-century Roman emperor whose name became synonymous with depravity, madness, and tyranny. It translates as “Let them hate so long as they fear.” Right. A giant angry dragon clutching the planet, bringing destruction from space. That’s a nice way to symbolize space missions. 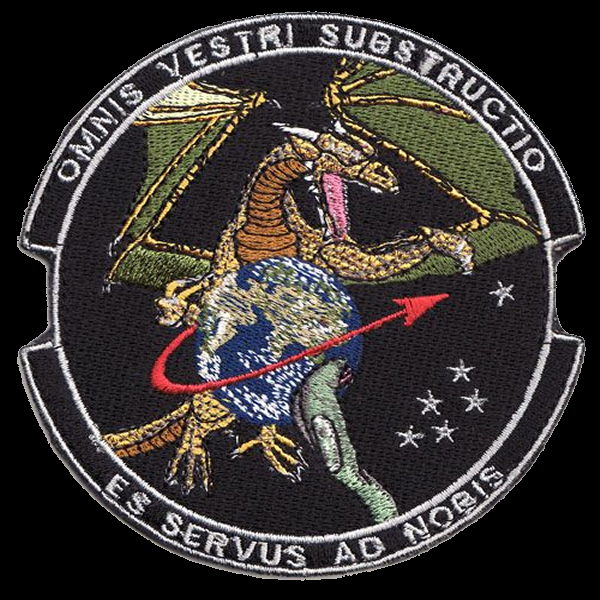 In PSYOPS symbolism, dragons typically represent signals-intelligence satellite launches; the dragons’ wing patterns symbolize the satellites’ massive gold-foil dish antennae meant to collect all types of information from earth. The phrase “Omnis Vestri Substructio Es Servus Ad Nobis” can loosely be translated to “All your base are servant to us”. This phrase does not make much sense, except that it vaguely states that the world is owned by those who made that patch. But this phrase is also reminiscent of a geeky 2002 Internet meme based on a poor translation in an old-school Sega game. The biggest internet meme of 2002, a badly translated Sega game. 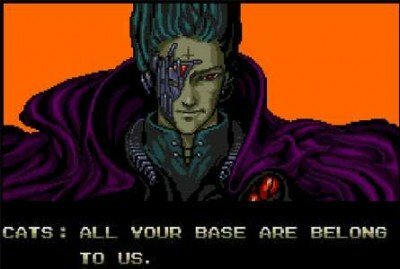 This allusion to popular culture is quite funny yet disturbing … I’m pretty sure they truly believe that all our base are belong to them. The PAN satellite was launched in September 2009 and is so top-secret that no military or governmental organization claimed to have built it. 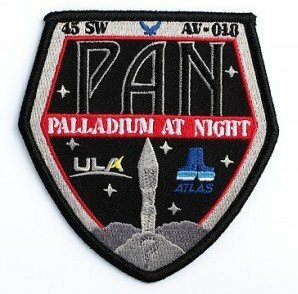 According to the patch, PAN stands for “Palladium at Night”, Palladium being a silvery-white metallic element that is probably present in the satellite. The mission is so secret, however, that it is jokingly said that the name PAN actually stands for “Pick a Name” (notice the subtle question mark underneath the rocket on the patch). 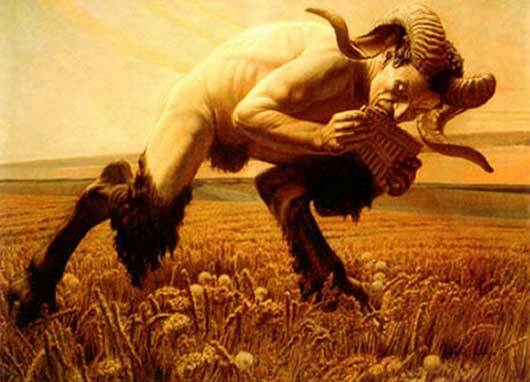 PAN is also the name of an ancient horned god important in occultism and that has a strange link with the history of rocket science in the United States. The ancient god Pan, a nature deity with phallic attributes. 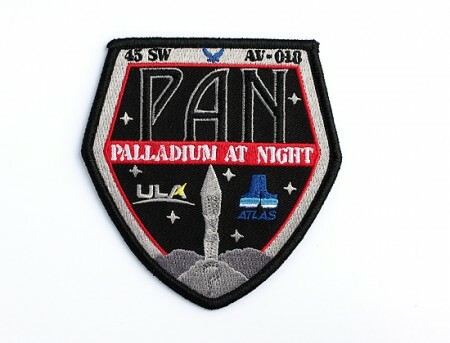 Is it me or is the PAN mission patch also rather phallic? Jack Parsons, a pioneer in American space propulsion who is often credited for having “propelled” the United States into the space age (a crater of the moon is named in his honor), was also a notorious occultist. 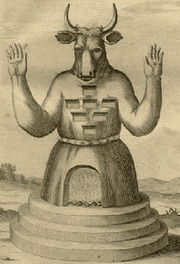 He was a prominent member of the Ordo Templi Orienti (the O.T.O. ), an occult secret society popularized by Aleister Crowley. Seeing no separation between his professional and his occult work, Parsons was known to chant Crowley’s poem entitled Hymn to Pan before each test rocket launch. Is Pan still invoked during rocket launches? 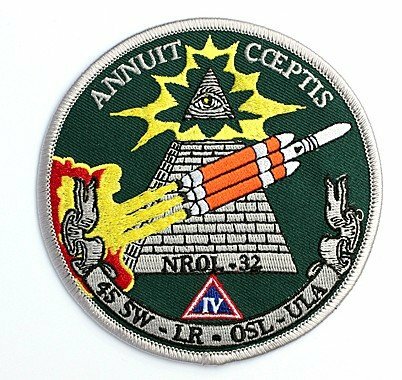 This is a patch for a NRO spy-satellite launch. Those familiar with this site will probably recognize this Illuminati 101 symbolism: An unfinished pyramid topped by the All-Seeing Eye. This All-Seeing Eye requires help: it needs spy satellites to be even more all-seeing. “LMA” at the bottom right most likely refers to Lockheed Martin Aerospace, which is the ultimate Big Brother mega-company working with the CIA, NRO, NSA and IRS. Above the All-Seeing Eye is written “Supra Summus”, which can be translated to “Most Superior and Highest”, which, if nothing else, indicates a healthy level of self-esteem. Other NRO spy-satellite launches have also used similar designs. The 23rd Space Operations Squadron (23 SOPS) is a United States Air Force unit located at New Boston Air Force Station in New Hampshire. The patch of this mission features a creepy-looking figure in a creepy hood looking over the earth with creepy eyes, staring creepily at the American continent. However, that is not the creepiest thing in this patch. If you look closely at the contour of the black face, you’ll see another face, with pointy nose and pointy ears, looking left. Who is this creepier dude within an already creepy dude? And what’s up with all the layers of creepy? 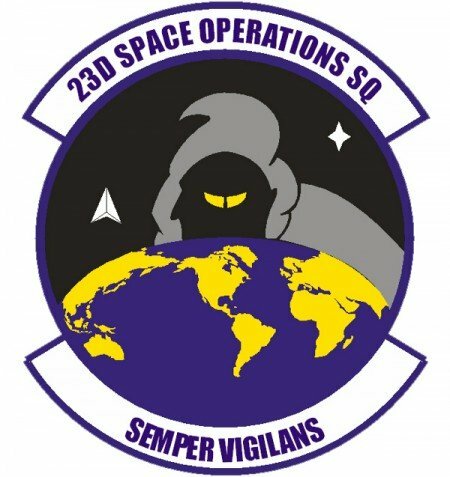 The saying “Semper Vigilans” means “Always Vigilant”. At least I can relate to that. But in the context of this patch, it is definitely creepy. Are you thinking of selling your condo and your Prius in order to leave everything and “go off the grid”? Try it and this knight might slash your head off. It would probably be useless anyhow. Look closely at this patch: there is no “off the grid”. This patch actually depicts the “information grid” those crazy conspiracy theorists keep rambling about, complete with nodes at the intersections. Defenders of the Domain is a subgroup of the NSA Information Assurance group and is comprised of individuals “who are on the front lines in developing the strategy, the concepts, the planning and the technical implementation in the Information Assurance domain. They are the true leaders in the world of Cybersecurity.” In other words, they monitor the cyberspace using the latest technologies. The man with the sword is in the distinct dress of a Knight Templar, this ancient group of Crusaders that became an occult secret society. The Knight represents the descendants of the Templars, the modern Illuminatus. This is another mysterious patch of the NRO. The program associated with this patch is totally unknown. All we know is that it is represented by three menacing vipers wrapped around the the earth, making us all warm and fuzzy inside. The Latin inscription “Nunquam Ante Numquam Iterum” translates to “Never before, never again.” What never happened before and will never happen again? We may never know. You know that a mission is top-secret when not even an obscure symbol can be used to represent it. This patch was designed as a generic insignia for “black” projects conducted by the Navy’s Air Test and Evaluation Squadron Four. The Latin phrase “Si Ego Certiorem Faciam … Mihi Tu Delendus Eris” is roughly translated to “I could tell you … but then I’d have to kill you”. That is cliché phrase, but considering these are the people who actually created it, they probably don’t think it is corny. In fact, they’re probably dead serious about it. Furthermore, there is a twist on the phrase. According to Paglen, the Latin phrase is worded in a peculiar way in order to refer to Greek and Roman texts. So the badge does not contain a simple death threat: it also alludes to a “wrath from above” of mythological proportions, turning your city into a wasteland for generations to come. Now that’s a threat. 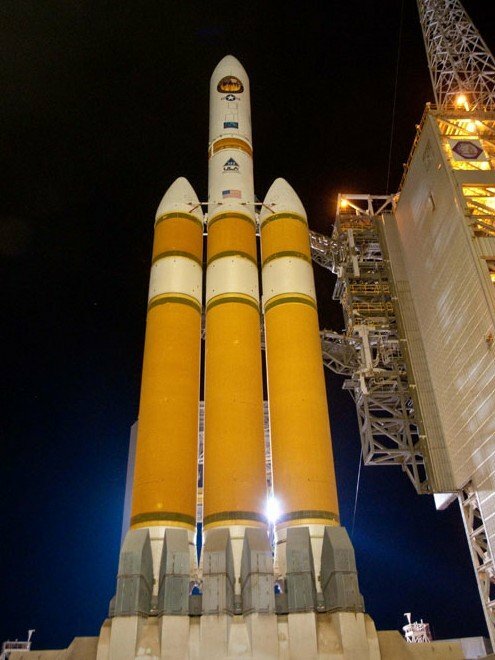 The Minotaur program is composed of top-secret NRO spy-satellite launching missions. Minotaurs are bull-headed creatures from Greek mythology that are always angry, violent and merciless. 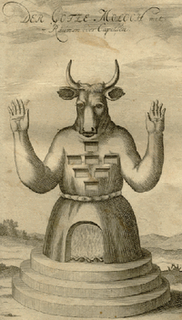 Minotaurs bear many resemblances to the Middle-Eastern deity Molech, a bull-headed god with the body of a man to whom child sacrifices were made. 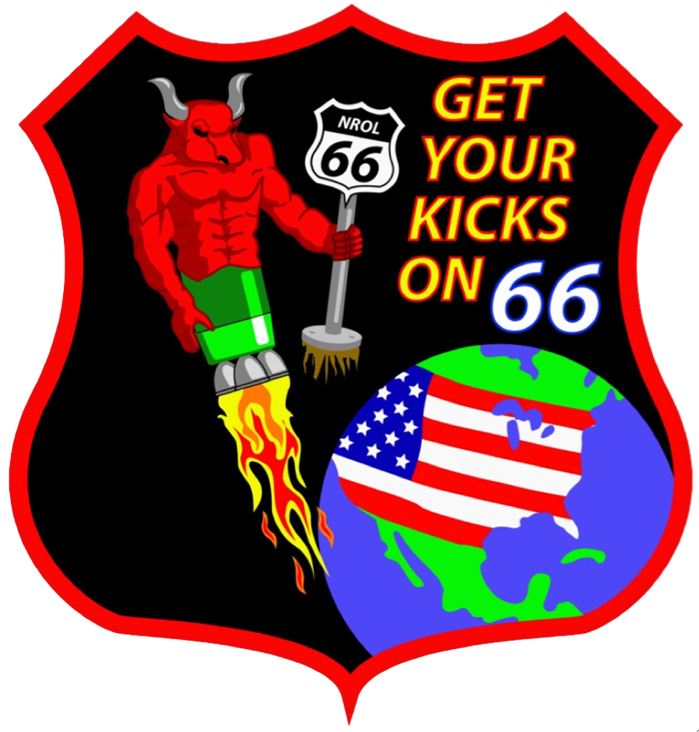 In this patch for NROL-66, the red Minotaur (as if hailing directly from hell) is holding a street sign of the mythical route 66. It is rather difficult not to see an allusion to the devil (who is often portrayed in red) and the number 666. Furthermore, according to some occult researchers, route 66 was originally laid out to become a sort of “occult pilgrimage”. Route 66 began at the Buckingham Fountain in Chicago, near the site of the University of Chicago’s collection of Aztec ritual incunabula. It ended in Barstow, California in the Mohave desert, which is for the Freemasons, the cosmic graveyard of the West, the final destiny of Anubis, the celestial jackal, otherwise known as Sirius (see Giorgio de Santillana andHertha Von Dechend, Hamlet’s Mill: An Essay on Myth and th Frame of Time, p. 358). So who is really getting their kicks on Route 66? This patch for NROL-49 depicts a phoenix rising from the flames with the flag of the United States in the background. The Latin words “Melior Diabolus Quem Scies” roughly translates to mean “The Devil You Know,” as in the phrase “Better the devil you know than the devil you don’t know”. Cryptic. According to NASA, this saying refers to the return of the use of an old system after attempting to use a new one, which had resulted in failure. 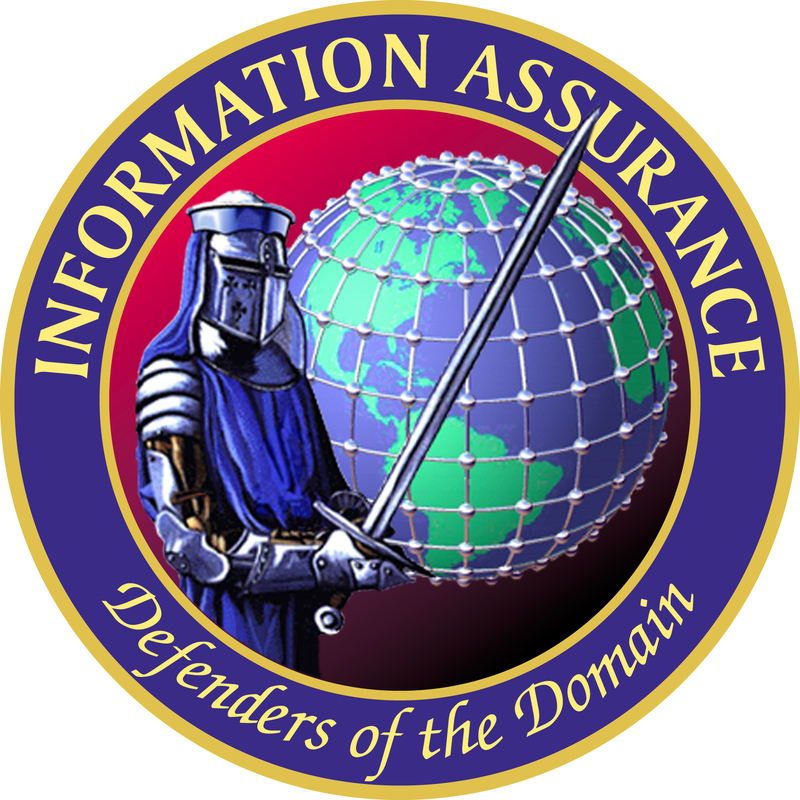 It is a rather odd choice of words for a governmental agency, but definitely on-par with this whole sinister, hellish theme going on with PSYOPS patches. 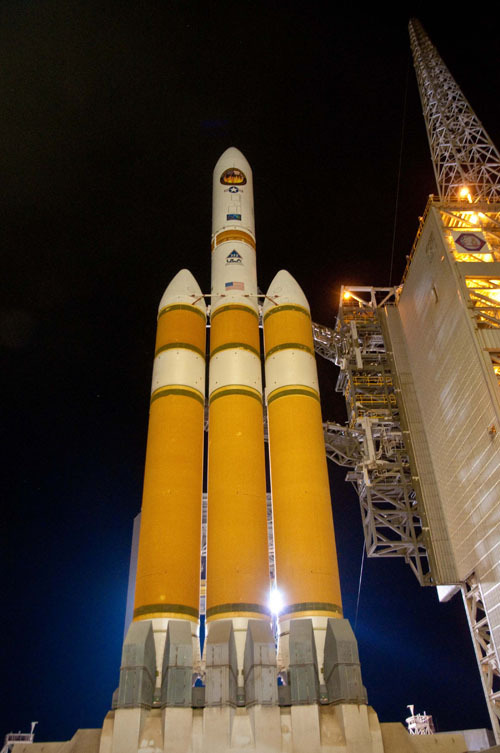 NROL-49 before its launch featuring its mission patch at the top. 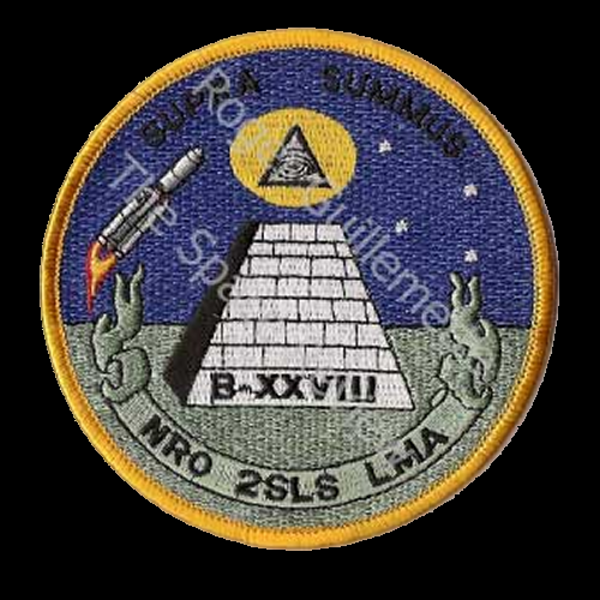 Another patch related to NRO-49 depicts the satellite as a winged fiery being (referred to by NASA as a devil named Betty) who is holding a trident and a wrench. The patch shows the moon (or a comet?) partially covering the earth. If you look closely, there are letters in the detail of the grey astral body. What do they refer to? At the bottom of the patch, the Latin phrase is also enigmatic: “Primoris Gravis Ex Occasus”. Primoris means “First”, Gravis stands for “important, heavy or serious” and Occasus means “setting of the sun, the West, or fall”. In other words, I don’t know what it means. “First heavy setting of the sun”? “The most important thing after the sunset”? “First serious fall”? Regardless of the exact meaning, there seems to be an emphasis on the concept of darkness. Betty is pure darkness wrapped in flames and is partially covering the sun. There is a grey celestial body moving towards the earth … and we’re still talking about a spy-satellite. Okay. Wizards controlling the earth through magic is a recurring theme in PSYOPS patches. Is magick still a part of rocket launching like in the times of Jack Parsons and the O.T.O.? What do the letters at the bottom mean? None of your f***ing business. No, I’m not being rude…that’s what the letters stand for. Another NRO patch, one that pretty much sums up the meaning of all of the above. The spy-satellite is symbolized by an angry dragon clutching the entire planet with its four claws holding a diamond in its tail. It does not seem to preoccupied with our privacy and other petty things like that. Although it isn’t possible to know exact meaning of the symbols found in these mission patches, they still provide a rare insider’s look at the philosophy, the mind state and the background of the organizations creating them. Sorcerers controlling the earth, vipers surrounding the earth, angry dragons clutching the earth … this is how they perceive themselves and their work. My question is: Should we maybe be a little concerned? One could argue that these patches are meant to be menacing to America’s enemies. This could be true, but most satellites launched by the NRO are meant to spy on North America, hence the emphasis on the continent in many of these patches. 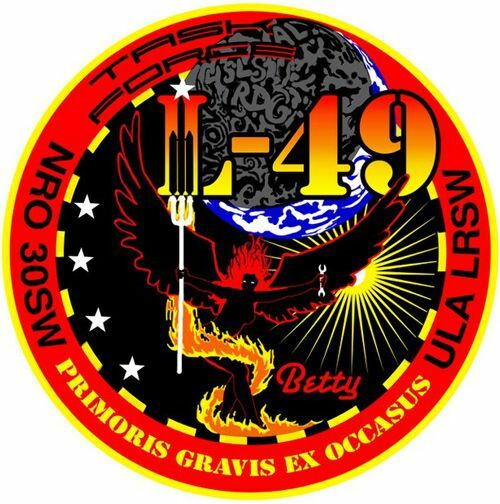 One thing is certain, mission patches are the most honest descriptions we have of these secret missions. Since most of the patches were not intended for mass exposure, they are devoid of public relations sugar-coating. The patches do not talk about “bringing democracy and the light of freedom to the world”… they show the world in chains and in flames, controlled by dragons and sorcerers, and their words threaten death and destruction. The occult symbolism illustrated in these patches is also reminder that these organizations have relations to secret societies and are “in the know”. And those who are not in the know, the uninitiated masses, the profane, are not welcome. In recent decades, the consciousness of humankind has progressed rapidly. Indeed, today, we are in the throes of the greatest transformation in the history of humankind, a shift to a New Reality of heart-centered consciousness. We stand at the gateway of an unprecedented turning point in human consciousness, a social and spiritual transformation called The Shift. One of the hallmarks of the New Reality is that people are becoming spiritually self-empowered. In the Old Reality, it was necessary for people to follow a rule book of moral behavior in order to stay upon a path which avoided temptation and its undesirable side-effects. With New Reality consciousness, order comes to society automatically because people are heart-centered. They simply don’t engage in actions that would be harmful to themselves or others because they unconditionally love all people, and would therefore do no harm to anyone. New Reality consciousness is one of responsible freedom. With it, people are self-empowered and fully consider the effects of all of their actions from a place within their hearts. Heart-centered consciousness develops the flow of unconditional love. Once this flow is started, nothing in physical reality can affect it in a negative way. It is not altered or rationed by likes and dislikes, nor by emotions of any kind. It is something that just is, regardless of the circumstances. It is an expression of the love of God, which exists in every part of the universe and flows through each one of us, if we but allow it. Unconditional love is something that readily flows through your heart when you reach upwards above regular, day-to-day consciousness, open your heart and just allow the flow to come through. Unconditional love is, by its very nature, allowing, accepting and supporting. As a state of allowance, it is not something that you have to try to do; it just flows when you allow it to enter your heart. It will raise your consciousness above the cares of daily reality and open up an expanded vista of awareness. Each time you allow unconditional love to flow, you upgrade the entire human experience, taking humanity yet one more step into the unfolding New Reality. This was an excerpt from Freedom of the Spirit: Four Powerful Steps to Spiritual Freedom by Owen Waters. This deeply insightful e-book combines some of today’s most proven and time-tested spiritual practices into one powerful and effective package.